Korea Cymbidium kanran Makino can do that peep when cool wind begins to blow and see flower until February. Is called "Korea Cymbidium kanran Makino"
("Korean-HanLan or Jeju-HanLan" -Decan grass is orchid in the winter) as this reason. Korea "JeJu" orchid Cymbidium kanran Makino and JapanCymbidium kanran Makino are from Oct. 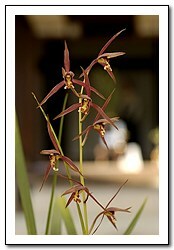 In to Dec, China and Taiwan Cymbidium kanran Makino are from Nov. In over Feb. blossom . Fragrance that orchid is secluded and clear is unusual article. Add hereupon and is orchid that dealer of deep elegant and nice leaf is attractive with lofty personal appearance that can appreciate four seasons. Flower stalk has various pattern as well as leaf displaying various change in long flower and flower shape, peaceful countenance. Make flowers open 3 ~ 9 flowers to one flower stalk usually. Shoot of orchid rises ivory-white like skin on the whole. As well as, is presenting enough delight to us by shoot having orange light or pink according to species, clean red color etc.. colorful and mysterious color. 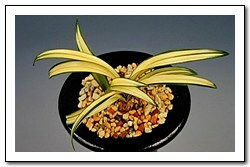 Cymbidium kanran Makino leaf than orchid that bloom in the spring more brightness pass and soft curved line have. Cymbidium kanran Makino that is made in soft curved line that have brightness is enough to have excel Ipsae itself does appreciator. Also, is raising is displaying various kinds pattern to leaf and do appreciator more. Flower that peep since October is high do appreciator and is receiving many loves from the example to be giving that is elegant of leaf that is beautiful perpetually even if flower is gone and there is brightness. Do not fit when see as Spring Orchids' standard that give do tall appreciator to round petal having thin than Spring Orchids' flower and cultrate petal but have characteristic that mild state of petal is prior in Cymbidium kanran Makino preferably. Beauty of unfilled space that is felt in arranged wide gap of mild petal, petal to flower stalk that go is getting into appreciation standard of orchid flower justly. Orchid that do area that air humidity possesses high and quantity mild climatic condition by oceanic climate to natural habitat is ranging in China and Japan, Taiwan including Korean Island Cheju. Can assume in specification place that is limited by delicate propensity extremely. Orchid that ventilation selects good place and grows spontaneously to forest area that oak or fir tree etc. is growing spontaneously mainly whole year half the year degree rich sunlight receive be able to must. "Jeju-Hanlan" that is called "Korean-Hanlan" grows spontaneously in Korean Jeju-do. Is Seogwipo-city and South-Jeju that is Mt. Halla south area mainly can assume between above the sea 200 ~ 600m over member. Handful was found in southland, but there is difficulty to attract interest to grow spontaneously in limited extent constitutionally. Was found much in chief mourner area one time as well as "Jeju-Hanlan", but now is situation that establish protection nausea and manage protection in the country. Is fenced by cultural asset protection method being specified by national monument No.191 already at November, 1967. Leaf has short and smooth surface than Hanlan(Cymbidium kanran Makino) that Jeju-Hanlan (Jeju Cymbidium kanran Makino) that sonorous clear fragrance is characteristic is different. Even if leaf is short, that crawl nothing but compare to other "Hanlan" is that reach to 80cm. There is large size kind that reach to leaf width 2cm, but leaf length is 30 ~ 50cm usually and leaf width are within 1.0 ~ 1.3cm. That become to leaf edge like saw tooth be rough but become even though is not compared to Spring-Orchids enough to microscopic. It classifies by blue color order flower that bloom green color, and flower that tip some is turning much. Clear dyed clothes flower that have monochromatic white tongue that do not mix of other color is found occasionally, perfect white flower is not found yet. By pattern kind of leaf "Middle Line Pattern" some species find. "Jeju HyangLan coterie" and "SeoGwiPo orchid coterie" are making efforts in species establishment chief mourner one early that chief mourner one helps and holds Jeonsihoeeul chief mourner one every year in cultivation being made in Jeju-do.